Much has been said of the Anthropic Coincidences, the special values of physical constants and force laws that enable a universe to support carbon-based life. Even more remarkable, I believe, are the wonderful physical-chemical processes that sustain the life of living things, from the simplest one-celled organisms to us, all of which are made possible by hydrogen bonding. In an early article, The Theology of Water, I discussed the marvelous and unusual properties of water, properties that stemmed from the nature of the hydrogen bond, properties that enables an environment friendly to life as we know it on earth. In this article I want to explore in more detail the nature of the hydrogen bond and its significance for molecular biology and physiology. Hydrogen bonding plays a role in biochemical reactions, in anti-body mechanisms, and in all of molecular biology and, most importantly, in how DNA acts as a blueprint for the synthesis of proteins. A book would be needed to explore all of this in detail, so I’ll focus on the essentials — the basics of what a hydrogen bond is and its role in the structure of DNA. Let’s imagine God thinking in his design of nature, now I want chemistry to have not only strong interactions between atoms, but also gentle ones: so that complicated structures can unfold and rewind easily, and so that big and small molecules can come together and join for reactions and go apart readily — Velcro or a zipper, not glue or nails. What should I use? I have it — a hydrogen bond. Here’s the basic idea: H (hydrogen) bonded to O (oxygen) as in H-O-H (water) shows a slight positive electrical charge; :O, oxygen with a pair of unbonded (lone) electrons, shows a slight negative charge. Similarly, :N (nitrogen), with a pair of lone electrons shows a slight negative charge, and N-H, hydrogen bonded to nitrogen, show a slight positive charge. There is an electrical attraction between these small positive and negative charges; there is also, as nmr experiments have recently shown, a contribution from chemical bonding (sharing of electrons) to hydrogen bonding, so that it is more than simple electrostatic interaction. In the figure below are shown the types of hydrogen bonds important in molecules of biological interest. Superscripts, delta plus and delta minus, small net positive and negative charges. Watson (or was it Crick?) in a moment of insight noticed that the bases (nitrogen containing molecules bound to sugar pieces in nucleotides such as DNA, RNA) matched each other by hydrogen bonding like pieces in a jig-saw puzzle. They could thus stabilize a helical structure, by links across the spiral, as shown here. These bases are attached to sugar-type pieces, which in turn have phosphate groups on them that form the links between base units. The hydrogen bonds linking base pairs are strong enough to hold together the two DNA strands in the spiral helix, but weak enough that they can be “unzipped” by mild chemical action, an enzyme RNA polymerase, which yields messenger RNA. Before discussing the mechanism by which DNA enables protein synthesis, a few remarks are in order about the bases as letters in a word, words which encode which amino acids are used as building blocks in the protein. In this process a linear combination of three bases is used to encode which amino acid is put into a protein. So we can regard the bases as letters and the combination of three bases as a three letter word; the three letter word is called a “codon”. There are four bases* so there are 4^3 = 64 possible codons. There are 20 amino acids found in proteins, plus codons for beginning and ending protein synthesis, so that several codons may encode for incorporating the same amino acid, i.e. there is a redundancy. See here and here for tables showing specific codon/amino acid relations. 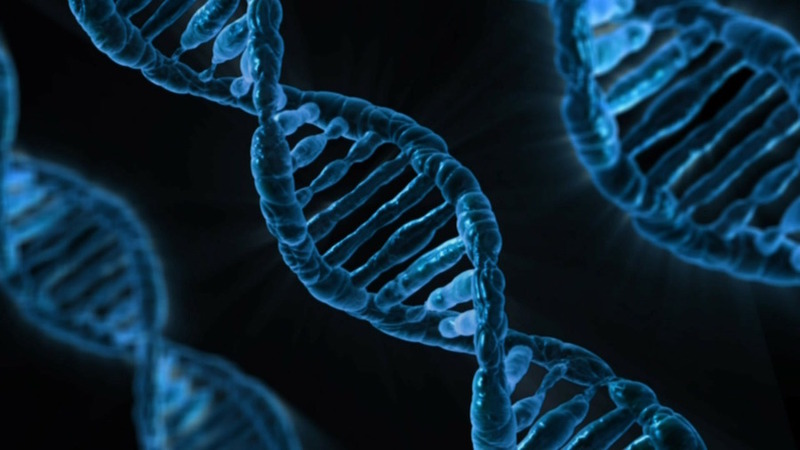 I’ll give just a brief summary here of gene expression–transcription and translation. More detailed accounts are given in the linked web sites and videos. Note that the RNA polymerase is a large protein, much bigger than the DNA strand. Also note that one strand of the DNA serves as a “template” — bases complementary to bases in the template strand are linked, e.g. G to C, C to G, A to T, U to A, and as they’re linked they detach to yield mRNA (messenger RNA). See the flash animation for a more detailed description of this process. Please see the linked animations — They will be well worth your while. STEP 2: translation — mRNA leaves the cell nucleus, goes into the cytoplasm where it attaches to a ribosome, where protein synthesis occurs. In the process transfer RNA molecules are sent by the ribosome to attach specific amino acids, coded by the m-RNA, to form a protein. This description is extremely concise — a lot is left out and I urge the reader to look at the recommended links, animations and explanations and to explore this fascinating subject. Summarizing gene expression in one paragraph is much like trying to do that for the Bible, Old and New Testaments. What amazes me is that molecular biologists and those who deal with gene expression, and all the other wonders of molecular biology don’t paraphrase Psalm 19A: “DNA declares the glory of God, and gene expression shows forth the work of His hands..”. Certainly the hydrogen bond, which is a crucial element in these processes, neither too weak nor too strong, is a marvel in itself. God’s providence in molecular biology is as marvelous as it is in physics. There are a series of posts from Biologos that explain in clear detail the gene expression process. The link above goes to the first in the series. 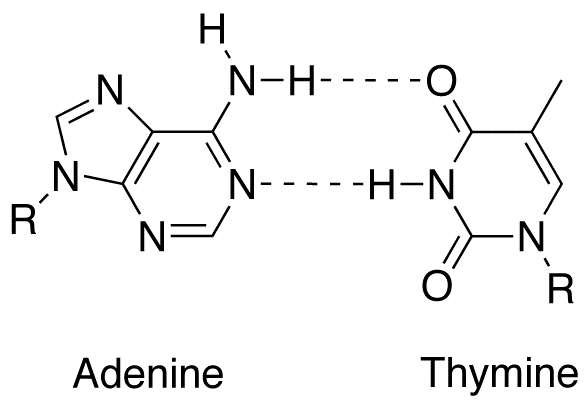 *Note: uracil replaces thymine in the RNA and is encoded by the complement of thymine, adenine–see the section on gene expression. The presumed explanation for this replacement is greater chemical stability of uracil compared to thymine. **Note: scroll down to get to the animation and click on the arrow to start it.